Celyad's T-cell immunotherapy approach is unique and builds on work conducted by Professor Charles Sentman and his team at Dartmouth College (Hanover, NH) : the NKR-T platform. Sentman was indeed inspired by the mechanisms of the Natural Killer Cells (NK Cells) which are another type of white blood cell. NK cells constitute the first line of defense against external agression and against cancer. 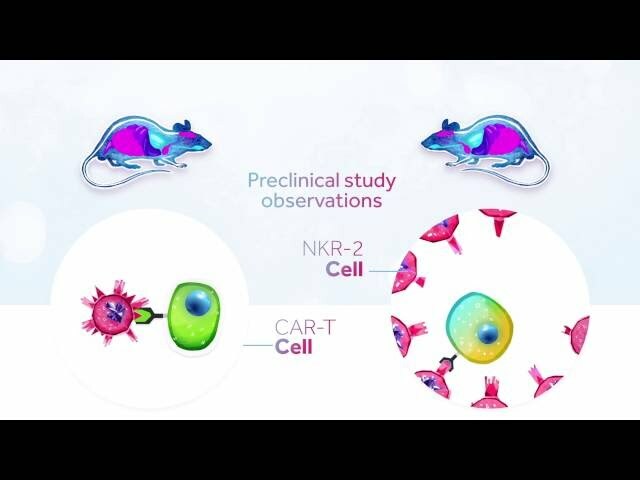 NK cells primary role seems to be surveillance, early detection and essentially to hold the line until T‑cells and other immune cells can come to rescue. Instead of inserting a gene that codes for an antibody in the T‑cell like in traditional CAR approaches, Sentman had the idea of inserting genes that coded for NK activating receptors (for example NKG2D or NKp30). These NK receptors do not bind with a specific antigen but with ligands. In order to provide the intracellular signal that will trigger cell killing once the receptor/ligand binding has occured, Sentman used the same signaling construct that in traditional CARs. NKR‑T also uses a co-stimulatory molecules to increase the potency of the cell but instead of being integrated into the CAR construct, this molecule is already naturally expressed by T-cells, making NKR‑T construct much simpler than traditional CAR’s. The CYAD-01 immunotherapy is unique and different from the other CAR-T cells currently developed. The NKG2D receptor has indeed the ability to bind to 8 different ligands that are naturally expressed by cancer cells in a vast majority of cancer cell types covering 80% of hematological and solid malignancies. Findings in preclinical studies showed that the ligands that are recognized by NKG2D are also expressed by the blood vessels that feed the tumor as well as the inhibitory cells that help the tumor evading the immune system. This means that the CYAD-01 not only targets and kills the tumor but its whole micro-environment but also demonstrated an induced adaptive immune-response thanks to the creation of a long term cell memory against targeted tumors (a bit like a vaccine).